Sometimes, all I want in a watch is simplicity and elegance: no unnecessary decoration, no extra knobs or bezels, just 3-hands, maybe a date and classic looks. Of course, there are tons and tons of watches ranging from under 100 to, well, the skies the limit, that satisfy this desire. 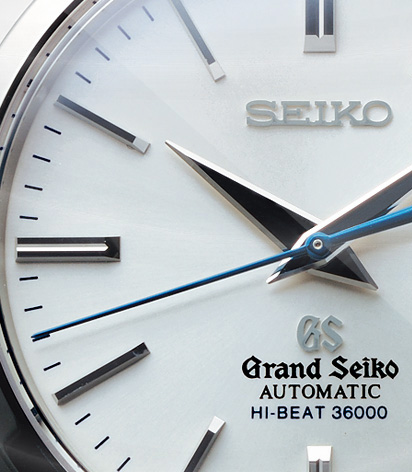 But one that stands out, and is thus worthy of a watch lust, is the Grand Seiko SBGH001 Hi-Beat. Unto themselves, Grand Seikos are really not very exciting. Their designs are staid, but well executed, and for the most part they have nothing particularly innovative on their surface. They come in a few flavors, most are 3-handers, there a couple GMTs, a diver or two and chrono…about what you’d expect from a conservative line. What makes some of them so interesting are the movements inside. In particular, there are models with Seiko Spring Drive Movements, which combine elements of mechanical and quartz watches, and a few models with a Hi-Beat mechanical movement. A Hi-Beat movement is simply a movement that “beats” at 36,000 BPH, which translates to 10 ticks per second, or an incredibly smoothly gliding seconds hand. There are only a few brands in the world with Hi-Beat movements, most notably Zenith, making them rare and desirable. While the Seiko Spring Drive actually has an 100% smooth glide, the allure of a Hi-Beat mechanical wins out for me. Of course, the movement is also highly finished, expertly crafted and tested. Grand Seikos are not to be confused with other mass-produced Seiko watches, they are designed and built to contend with the best watches in the world. The SBGH001 itself is a very classically styled dress watch with a distinctly 60’s aesthetic and a slightly sporty demeanor. The dial is clean white, the indexes are applied steel markers and the case is stainless as well. It comes on a steel bracelet, which compliments it nicely, though I’d like to see it on a brown leather or gator strap. The hour and minute hands are large, nearly oversized, reflective steel diamonds with beveled edges and the seconds hand is blued steel. Basically, the hands are the only stylized aesthetic feature of the watch, and while subtle, they are quite gorgeous. The overall appeal is that of restraint and class. For a watch that costs several thousand dollars, it does nothing to draw attention to itself. The smooth glide of the seconds hand and the exceptional mechanics that power it are details for your appreciation. This is a watch for watch collectors.